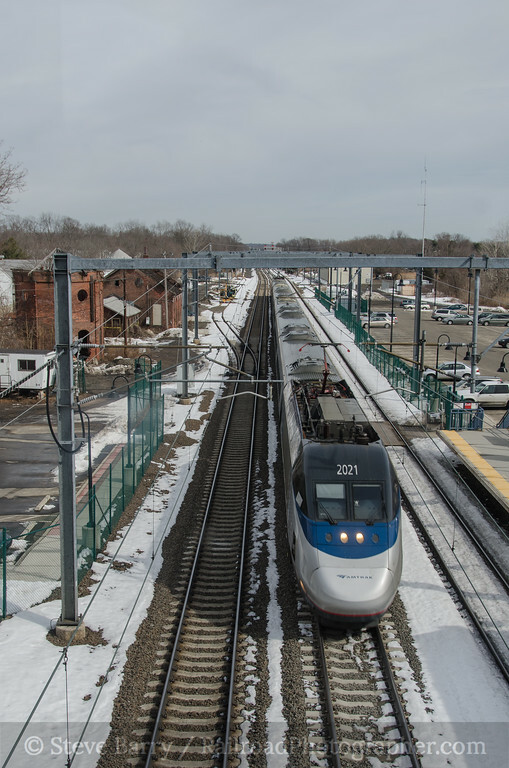 The Northeast Corridor is primarily the domain of Amtrak between Boston and Washington, but along the way pieces of it are used by various commuter carriers. In fact, if one were so inclined you could ride the entire corridor on commuter trains, save for a gap between Perryville, Md., and Newark, Del, and another gap between New London, Conn., and Wickford Junction, R.I. One of those commuter carriers is Shore Line East, which serves Connecticut primarily between New Haven and Old Saybrook, with some trains continuing west as far as Stamford and some continuing east as far as New London. 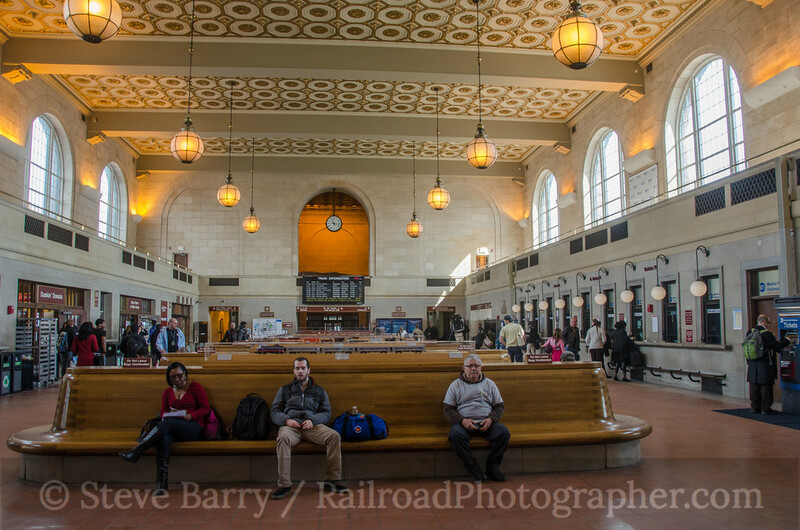 New Haven is also the eastern end of Metro-North's New Haven Line from Grand Central Terminal in New York City, with most trains terminating at New Haven's Union Station. Some trains continue one station further east to the small State Street Station. In today's post we're going to explore the trackage that is the core of Shore Line East, starting in New Haven Union Station (above). The Solari board, a train information board made up of flip tiles, is at the far end of the station. This board, and its distinctive clacking noise, is scheduled for removal from the station soon. Up on the platform, we find an M8 electric multiple unit set for Metro-North has just arrived. 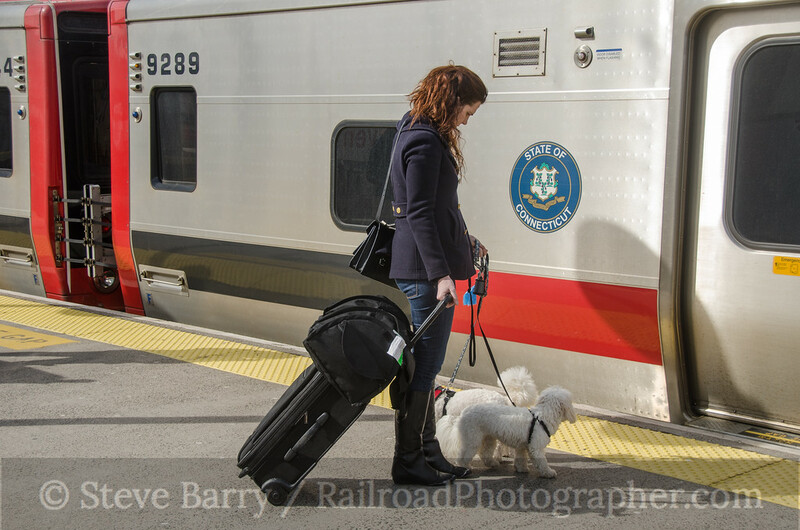 Passengers of all kinds wait for the doors to open. A set of M8s slip out of the station on its way to Grand Central. The train that appears to be from Amtrak is actually a Shore Line East train; SLE has a few former Amtrak diesels on its roster. Shore Line East was started in 1990 as a temporary service to ease congestion during a major construction project on parallel I-95. It proved very successful, however, and has been constantly expanding and improving ever since. All of the Shore Line East stations are new construction, with roomy parking lots. Most are located on the fringes of the towns they serve. After leaving New Haven we pass through Branford and arrive in the interesting town of Guilford. Another feature of Shore Line East stations are overhead pedestrian bridges, and most have nice clear plexiglass that allows for photography. 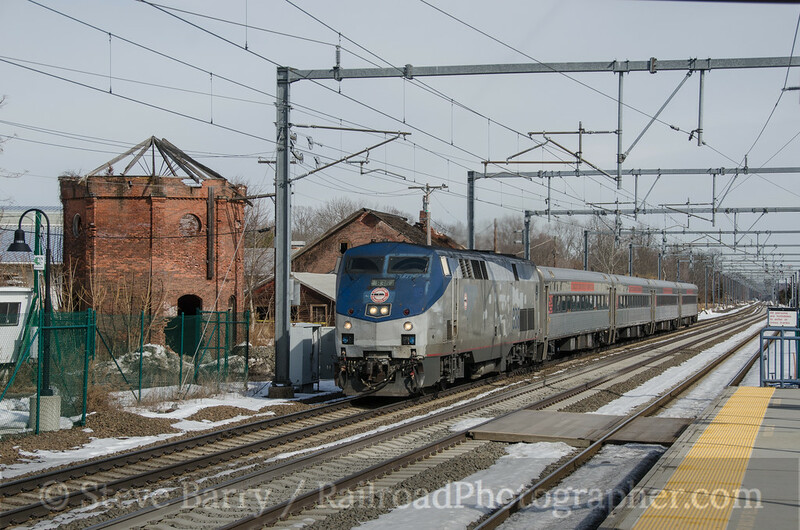 We get a nice look at a New York-bound Acela train as it rolls on the center express track through the station. Also in Guilford is a remnant of the past. The water tank that once quenched the thirst of steam locomotives on the New York, New Haven & Hartford still stands, and the town is in the process of stabilizing it for future restoration (albeit not as a functioning water tank -- there are no more steam locomotives visiting Guilford). The old New Haven freight house still stands as well, just beyond the water tank. And speaking of remnants, the ex-Amtrak diesel pulling a westbound Shore Line East train is a bit tattered. It has an SLE decal stuck to the nose and has had its Amtrak logo removed from the side. The patchy silver paint sort of makes it look like the unit is held together with bondo. 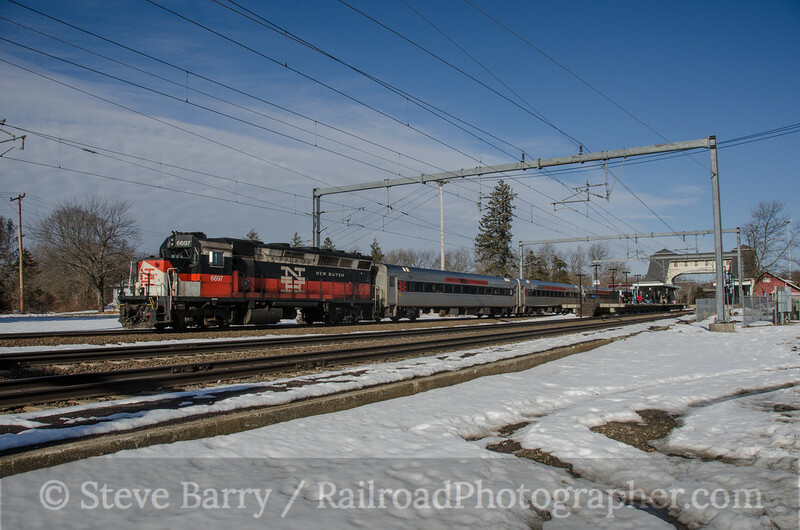 Old Saybrook is the final destination for many Shore Line East trains. The new station sits just west of the old New Haven wood frame station; the old station is now a pizza parlor. 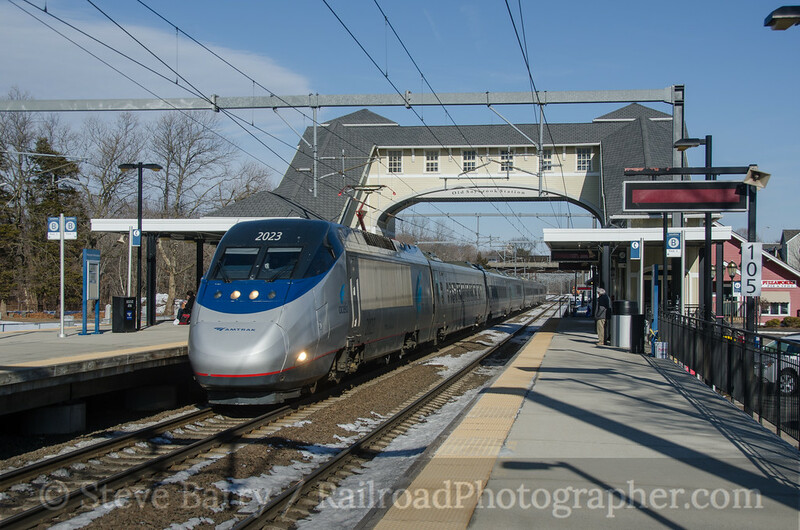 One of Amtrak's sleek Acela trainsets passes through the station at over 100 miles an hour. One feature of Shore Line East stations is you always know when a train is coming. An announcement comes over the public address system warning that you should stay behind the yellow line. It's an announcement worth heeding, because that approaching train may be from Amtrak, and they don't slow down. Shore Line East is funded by the Connecticut Department of Transportation, which also owns the equipment. 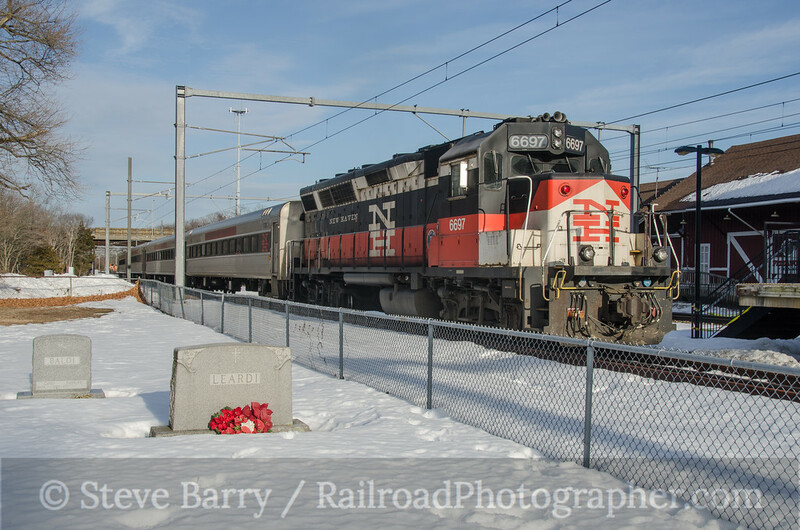 In a nod to history, ConnDOT's official railroad paint scheme is the New Haven "McGinnis" red, white and black. The scheme is informally named after Patrick McGinnis, president of the New Haven from 1953-1956; his wife Lucille designed the scheme. It features the blocky NH logo designed by Herbert Matter. Some of the Shore Line East locomotives wear the timeless scheme that looks as good now as it did when introduced. Of all the commuter railroads on the Northeast Corridor, Shore Line East is one of two that is diesel powered (Boston's MBTA is the other; MARC, SEPTA, NJ Transit and Metro-North all use electric power). Electrification historically stopped at New Haven until Amtrak extended it to Boston in 2000. 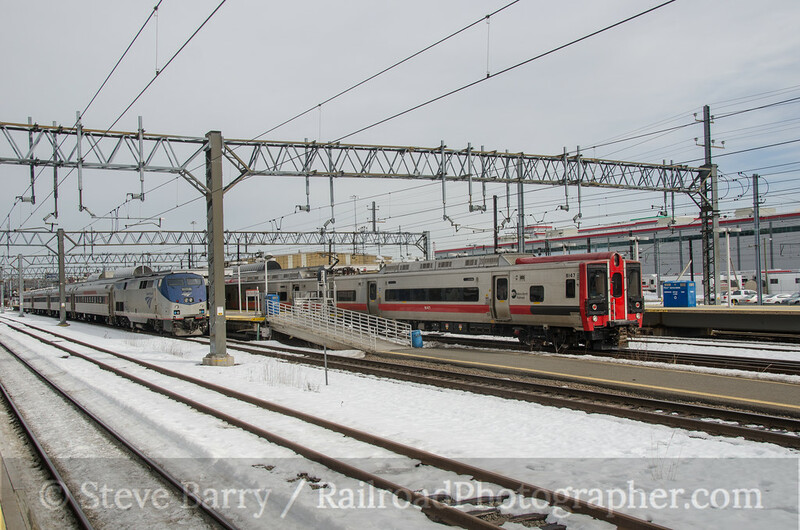 There has been some talk that perhaps Metro-North electric service should be expanded beyond New Haven to New London, replacing the diesels of Shore Line East (especially once all of Metro-North's new M8 cars are delivered). For now, we'll finish our tour of Shore Line East with another look at GP40-2H No. 6697 in the Old Saybrook station. More photos from this day can be found here.